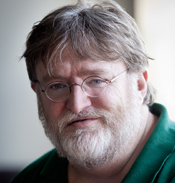 Gabe Newell is the President and co-founder of Valve Corporation, an entertainment software and technology company based in Bellevue, Washington. Valve’s debut title, Half-Life®, released in 1998, earned over 50 Game of the Year Awards and was named "Best PC Game Ever" in the November 1999, October 2001, and April 2005 issues of PC Gamer, the world's best-selling PC games magazine. Valve’s portfolio of entertainment has since grown to include Counter-Strike, Day of Defeat, Left 4 Dead, Portal, and Team Fortress®. This portfolio accounts for over 70 million retail units sold worldwide. In addition to producing best-selling entertainment titles, Valve is a developer of leading-edge technologies, such as the Source game engine and Steam, a broadband platform for the delivery and management of digital content with over 50 million accounts. Before starting Valve in August 1996, Gabe held a number of positions in the Systems, Applications and Advanced Technology divisions at Microsoft, where he worked for 13 years. His responsibilities included running program management for the first two releases of Windows, starting the company's multimedia division, and leading the company's efforts on the "Information Highway PC." For more information on Valve, please visit www.valvesoftware.com.